This is where I'm going to post it for now - as a salutory warning. This 'problem' only affects the 38mm stainless blue dial, model N80A66 and two-tone stainless / gold white dial model N80A696. 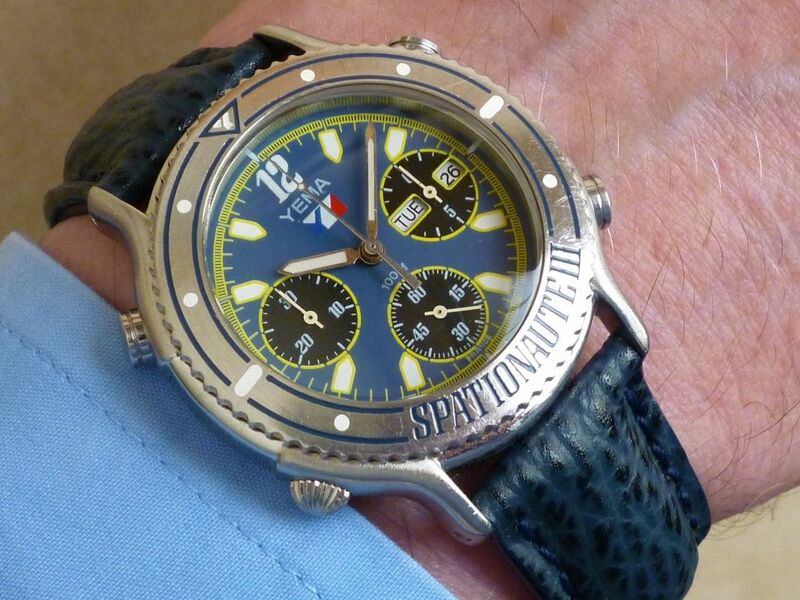 A few members own the full-size 43mm diameter version, model # N80P76. 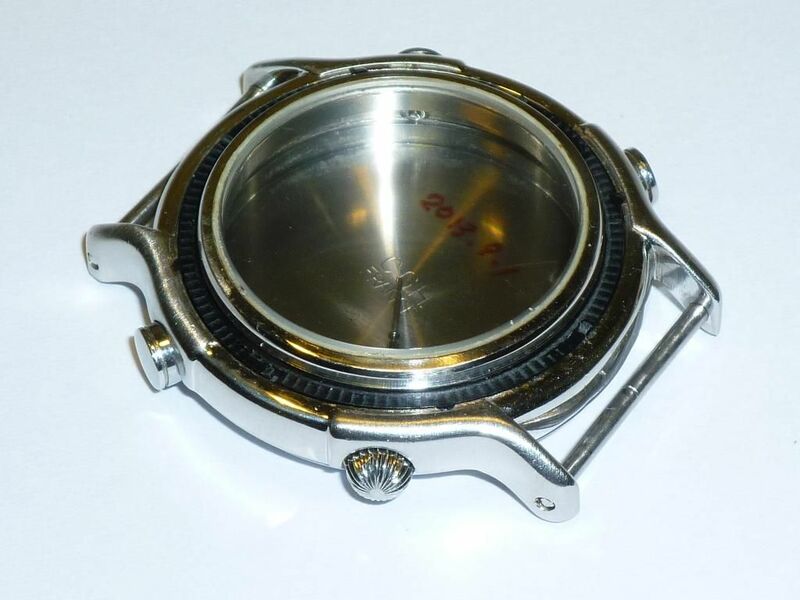 I remember a couple of people who bought them NOS from Watchfactory.com (eBay seller izeldor) complained about loose or weakly ratcheting rotating bezels. 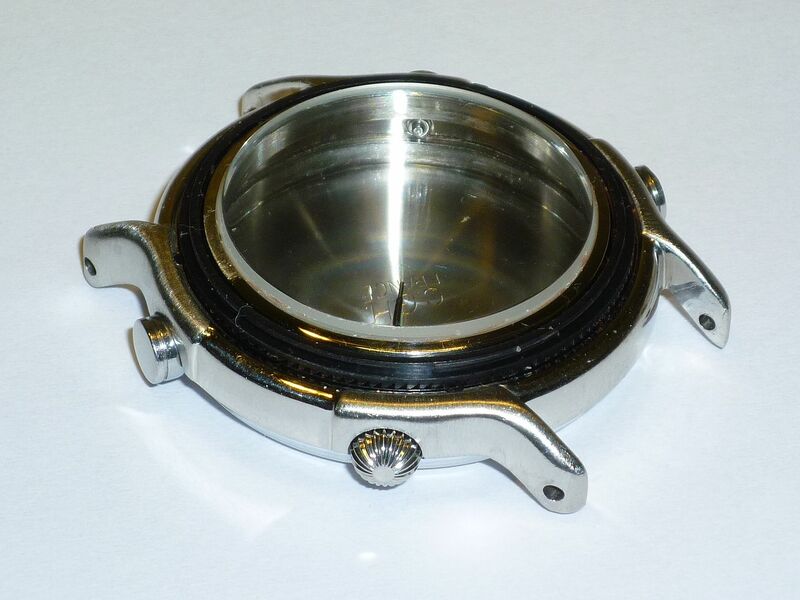 The bezel on that model is held on with a 'bent wire' retainer and the ratcheting detent is provided by a spring steel ring which sits in the recessed bezel track. So if you're not happy with the feel of your bezel, it's an easy matter to lever it off carefully with a case knife and tweak the wire or detent ring. Not so with the 38mm 'reduced' models I'm afraid. 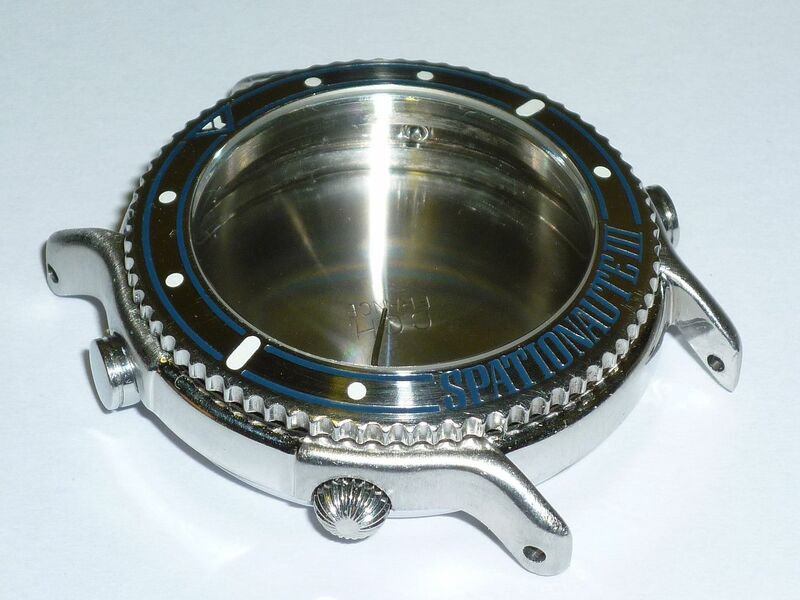 Back in November last year, I'd bought a 38mm Spationaute III N80A696 parts watch off eBay France. It was clear from the seller's photos, that it had already been abused by some incompetent watch botcher. Note also the non-original sweep second hand fitted. I wasn't particularly bothered, as I really only wanted it mostly for the movement, which was described as working - and the crystal. 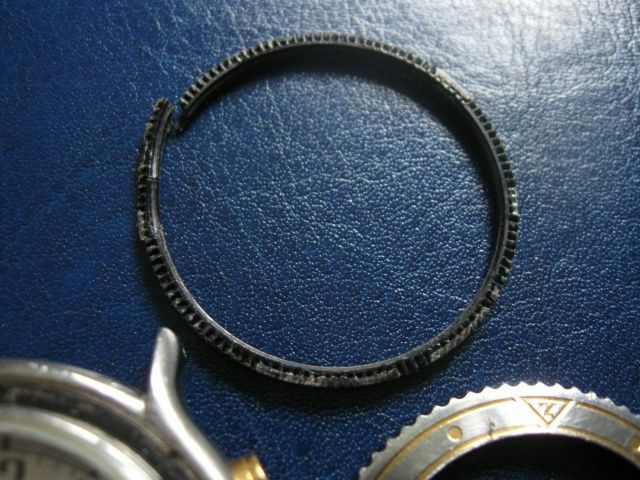 Now whereas I'm of the opinion that the 'bent wire' loop and spring steel detent ring Yema used on 43mm Spationaute III's is probably superior to Seiko's method of bezel retention, using a neoprene O-ring with a spring loaded detent ball - what they did with the 38mm 'reduced' versions most certainly is NOT. Basically the rotating bezel is held on / braked by two flimsy black plastic mouldings ! Unlike the 43mm Spationaute III's bezel, which has the ratchet teeth cast cast into its underside, on the 38mm version they're moulded into this black plastic ring, which clips inside the bezel and is supposedly prevented from slipping by one moulded pip which engages the machined cut-out at the top of my photo. 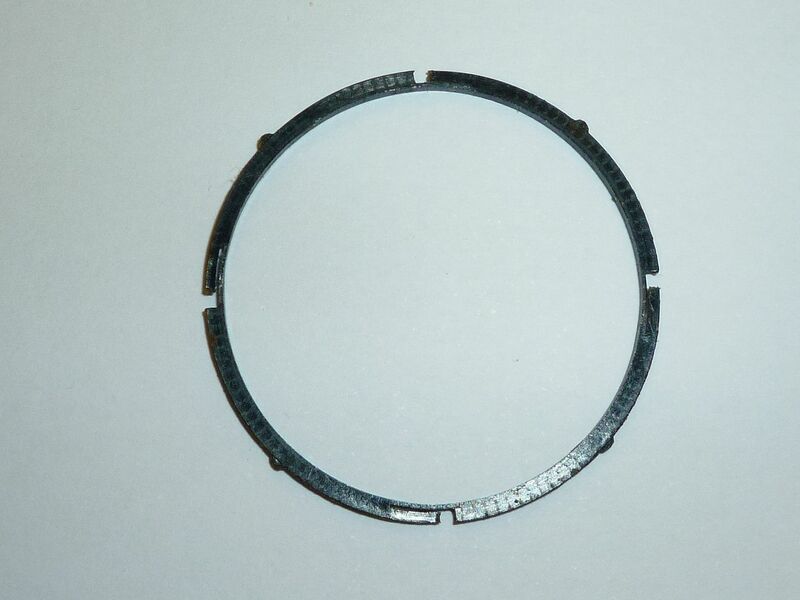 This black plastic ring also has a lip moulded into its inner circumference which engages a shallow groove in the watch case's bezel flange and supposedly performs the same function as the O-ring on a Seiko Diver's bezel. 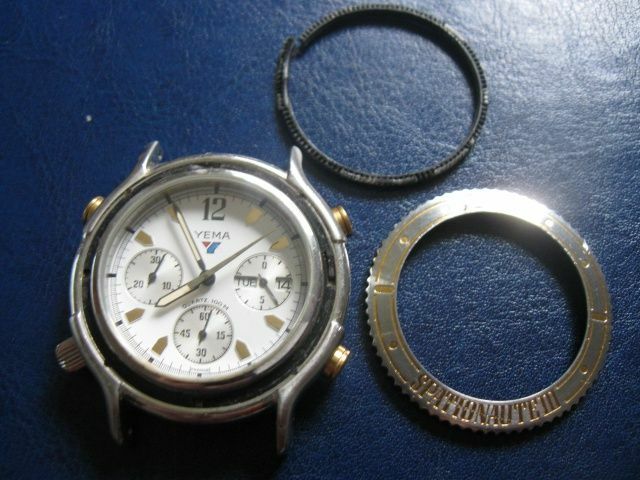 As you can see from the seller's photos, they'd already buggered up this plastic ring and had tried to glue it back together / back into the watch case - the white deposits (which I'd cleaned off) were plastic modeller's cement. I did think about trying to fix it myself using superglue, but not only is there a tiny bit missing, but the bezel itself has a nasty scratch through the word SPATIONAUTE (visible in their photos) - so I won't be attempting to re-use it. There's not a lot of point. 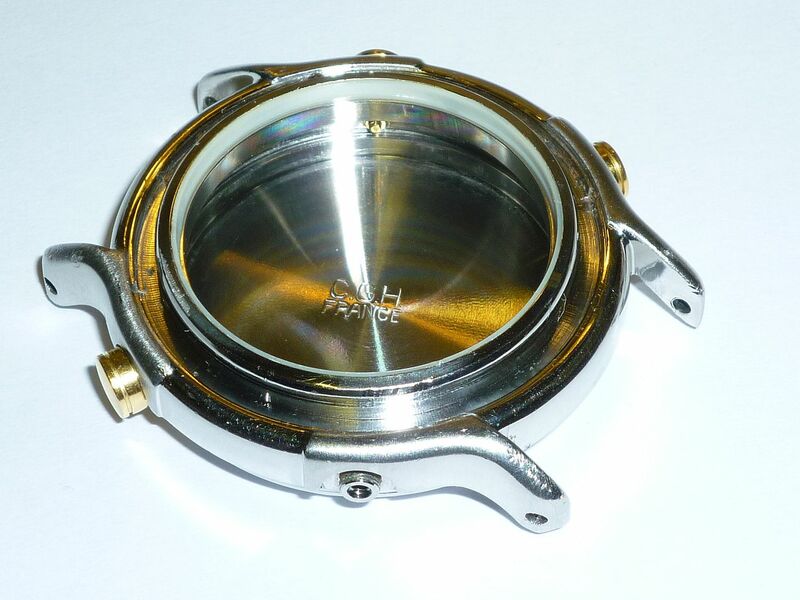 The above photo was deliberately over-lit in an attempt to show the case's bezel retaining flange and corresponding shallow groove. 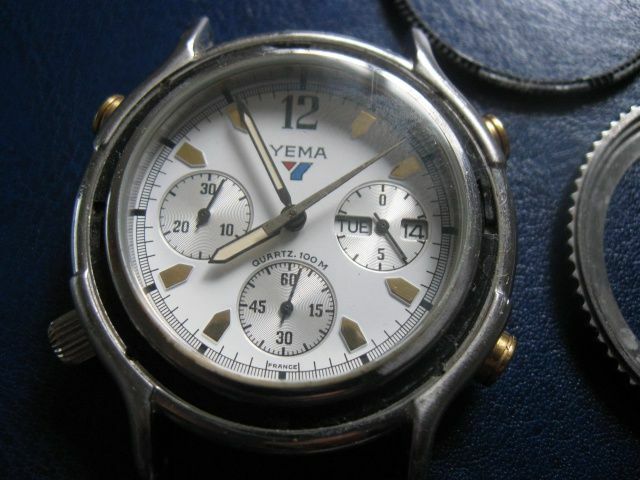 If you compare my two photos with the seller's you'll see I've since dug out the other flimsy black plastic component which sits in the machined groove in the watch case. 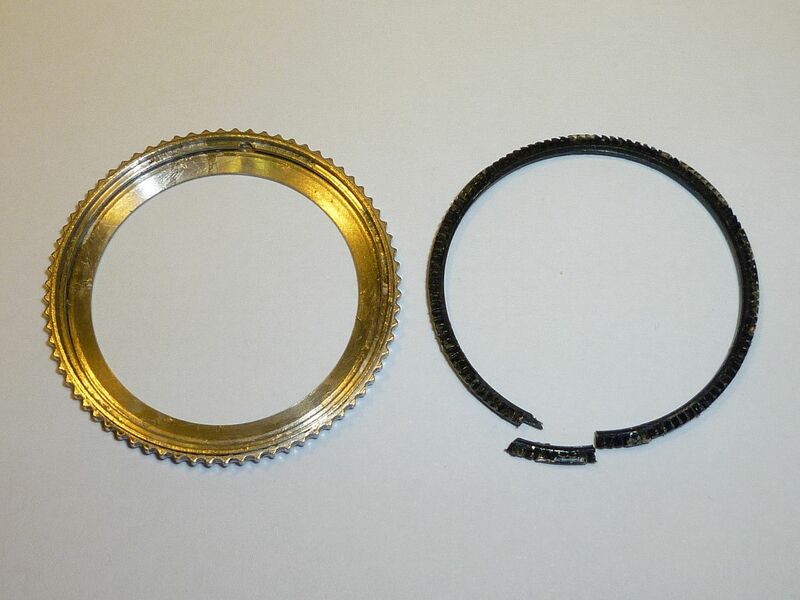 This circular moulding has four protruding pips which engage these drillings in the watch case. but there would once have been 4 raised detents moulded into it, where now there are 4 small gaps around the circumference. 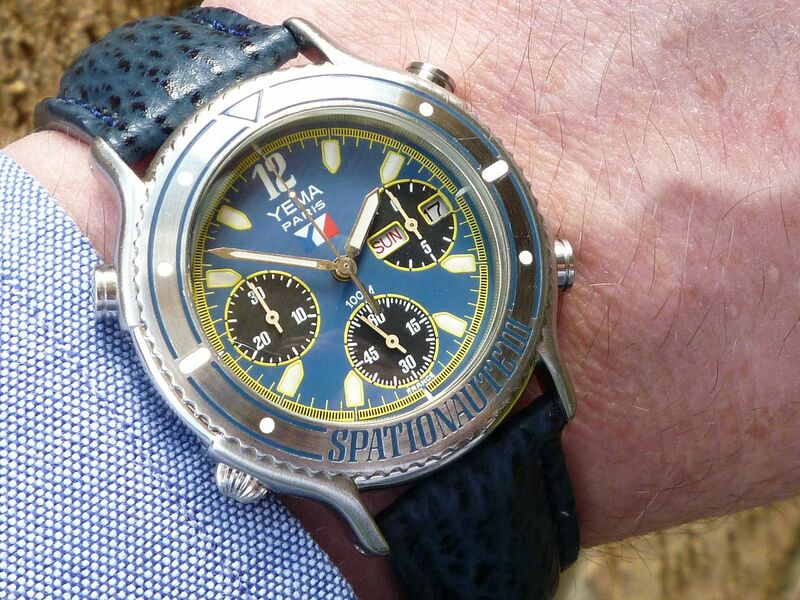 My latest quandry concerns the rather-less-common all stainless blue-dialed 38mm 'reduced' Yema Spationaute III model # N80A66. 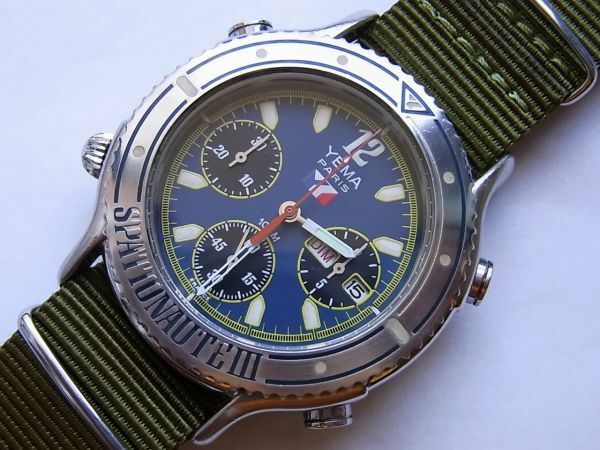 I'd bought this watch (as a split deal with someone else) on MWR back in September 2010, as sort of a long-term restoration project. I paid $75 for it (not $150). It had already been messed around with and needed quite a bit of TLC to make it half presentable. The biggest issues for me were the missing original screw-down crown (my tribulations written up in a thread on RLT) and hands lume. The bezel was quite scuffed, but because all the painted inlays were intact, it never occurred to me before to try removing the bezel. But then more recently this watch has developed a serious time-keeping problem. It first started losing time, perhaps 10-20 minutes per night, but now frequently stops at 12:55, during the day / date changeover. I say 'stops', but in fact what happens is the hour and minute hands cease to advance, but the constant seconds hand carries on merrily ticking away. 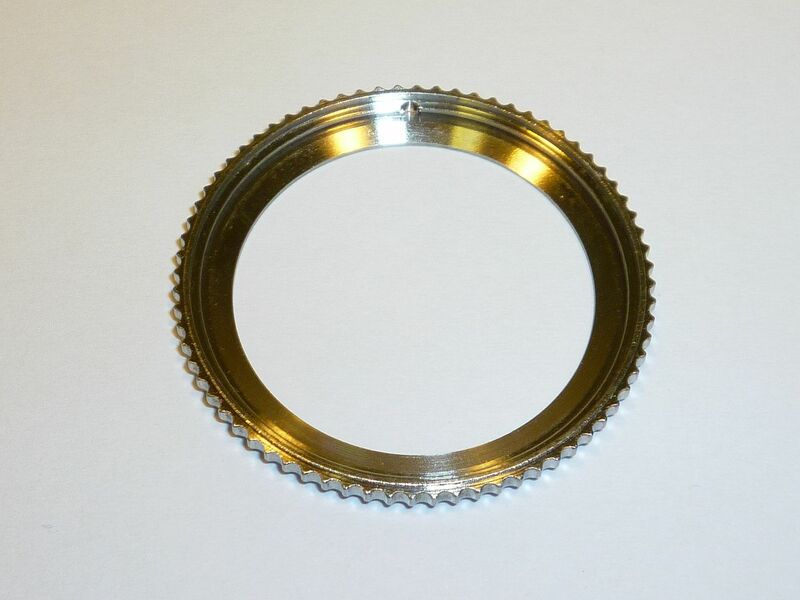 I suspect a slipping cannon pinion. 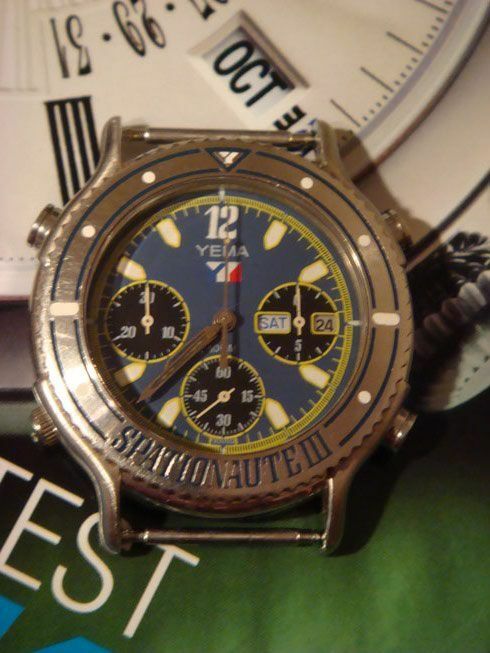 With Daisuke's help I've recently bought another one (slightly different dial printing: PARIS + 100M) off Yahoo Japan. I'm not quite sure what I'm going to do with it yet. 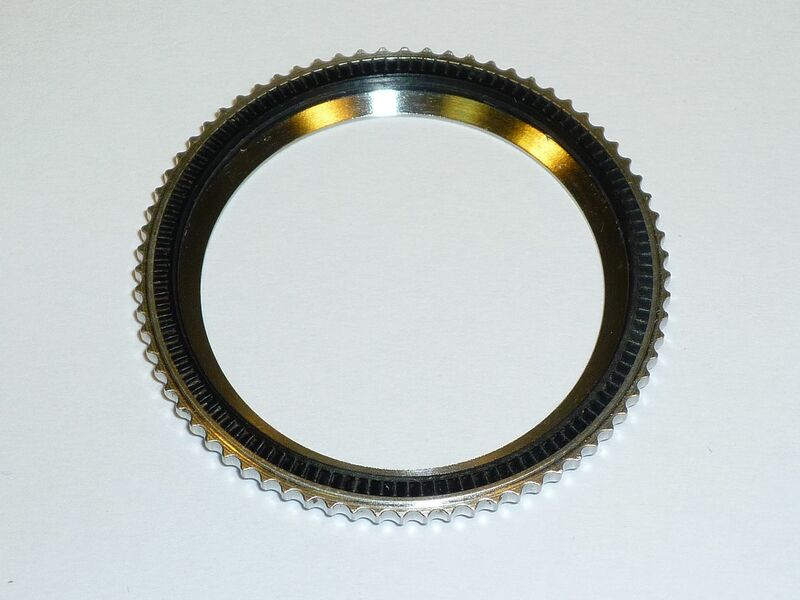 As my existing 38mm 'reduced' N80A66 has issues, I may use this for parts, to make a better one out of two. But as I have a spare set of Spationaute III hands to play with, I could make this a good 'un in its own right. That indeed still holds true, but as a first step, I decided to consolidate all the best components into one watch. Apart from a working movement (with better dial) the ex-YJ watch also has a potentially better (once re-painted) bezel and case-back. So you can probably guess what's coming. 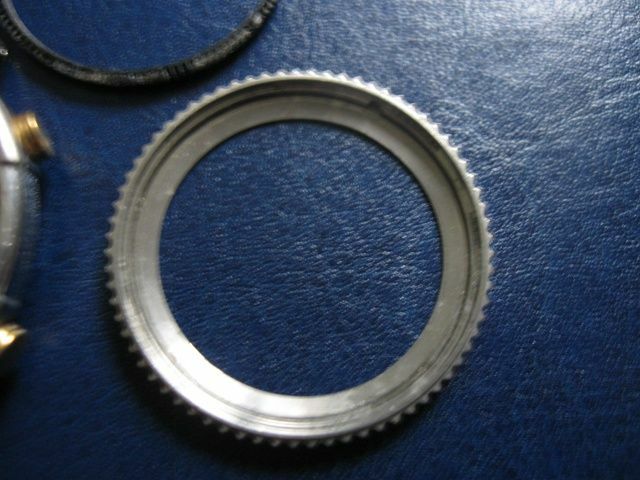 Again the teeth of the bezel component have left an impression in the track. You can just see a couple of the moulded plastic detents. The bezel came off exactly as it should, complete with it's plastic ratchet teeth insert still in place. 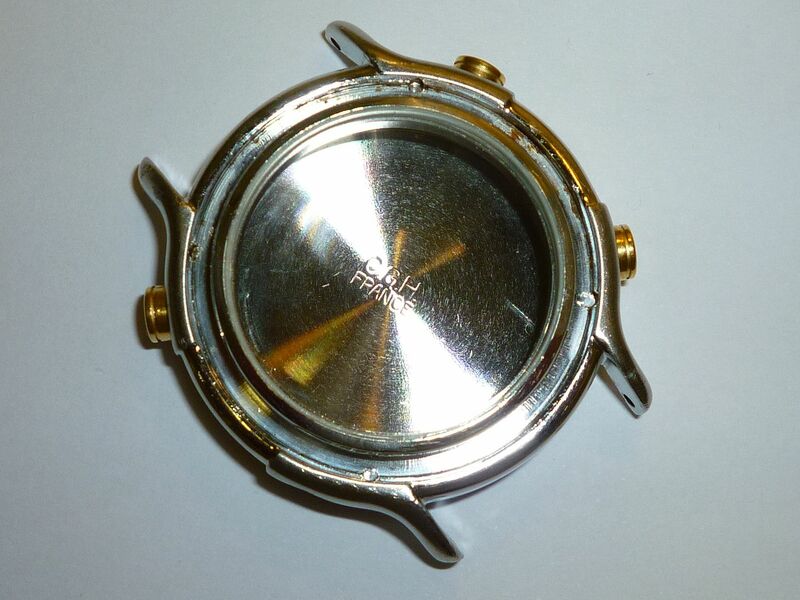 This time the bezel's moulded plastic insert stayed fixed to the watch case !! Knowing how fragile these mouldings are, there's no way that I'm going to try prying it off. I just hope I can get both bezels back on. 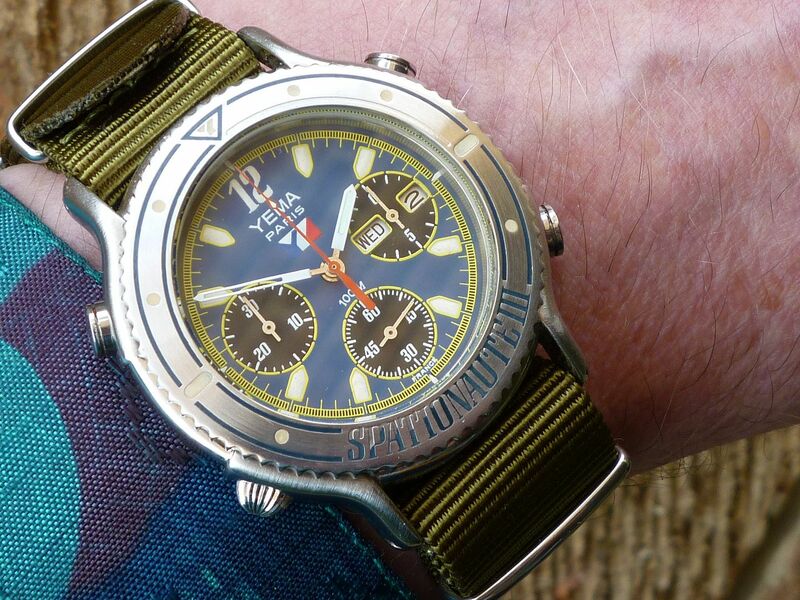 The moral of the story being: if you buy a 38mm 'reduced' Yema Stationaute III and the rotating bezel turns OK - leave well alone ! I decided to put them back as they were for now. While I had them off, I took the opportunity to lightly skim the scuffed bezel using 600 grade Wet and Dry. It helped get rid of all but the worst couple of scratches without losing much depth of engraving. I then cleaned it off and pressed it back onto the case - at first gingerly using just my fingers - then, once I was happy it was seated properly using the crystal press and a suitable diameter cupped nylon die. As I was giving it some welly there was an almighty crack - and for a horrible moment I thought I'd buggered it. But it was just the previously fatigue cracked nylon die crying 'enough'. It seems to be back on properly, with the same sort of gap between case and bezel, although after I'd cleaned the accumulated crud from under the bezel, it possibly feels a little looser than before. The cheap and nasty plastic ratchet detent still works fine. This afternoon, after lunch, rather than keep both watches in pieces, I quickly re-assembled one: swapping over the main hands between dials and movements between cases. This certainly won't be the final configuration, as I'm not convinced this (ex-YJ) dial is any better than the previous. Hence why I didn't bother to swap over the rather yellowed sub-dial hands. It ain't pretty but it works.